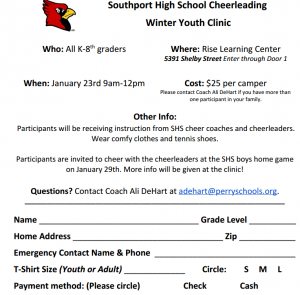 Southport High School Cheerleaders are hosting a Youth Clinic on Saturday, January 23rd from 9am-12pm for K-8th graders. The clinic will be held at Rise Learning Center. The cost is $25 per participant, which includes a clinic t-shirt and an invitation to cheer at a game with the high school cheerleaders! Contact Coach Ali DeHart with questions at adehart@nullperryschools.org. Cash or checks made out to “Southport High School” are both accepted methods of payment. Please return the bottom portion of this form and payment to Coach Ali DeHart in person OR mail to 6410 McFarland Road, Indianapolis, IN 46227 by January 18th. Hope to see you there!